A customer database is a necessity in pizzerias and in any restaurant where tracking customer activity or implementing a customer loyalty program is desirable. Enter a customer once then select the customer for future orders. No reentry of customer address is required. Customer information, telephone number and delivery instructions appear on every customer order. Use the customer database to send special offers by email or postal mail. Track customer order frequency and send offers to customers who have not ordered as frequently as they have in the past. Each customer in Point of Success Premium can be assigned several telephone numbers. Search for a customer by entering their telephone number, name or address. No matter whether a customer gives you their mobile number, their home number or any other telephone number, our pizza restaurant software remembers the telephone. Selecting a customer from the database attaches all of a customer’s information to the order without the need to enter the information again. 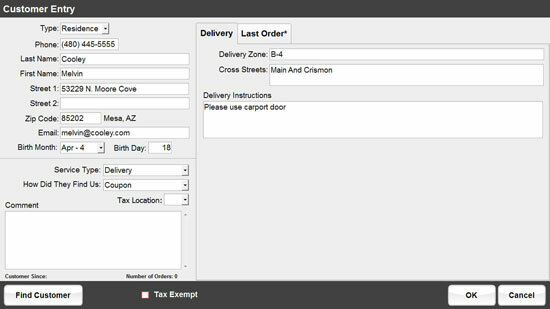 Delivery drivers have the information needed to quickly find a customer. Information includes delivery zone, cross streets and driver instructions.